This gift is a great choice for those looking for a classic Italian varietal made with rich California fruit. 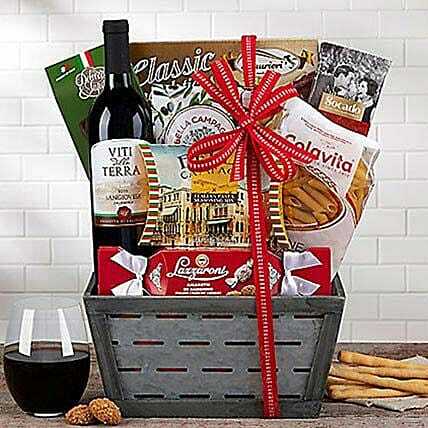 The hamper contains 1 bottle of Viti Della Terra sangiovese which has tart cherry and plum flavors with aromas of orange peel and cinnamon and is accompanied by olives, amaretti cookies, sesame crackers, asiago cheese spread, Italian milk chocolate pralines, almond cookies, Nonni's mozzarella cheese swirls, Mediterranean sea salt pasta chips and a wine stopper to round out this collection.Due to Local ordinances, gift baskets containing wine may only be shipped to the following states: AK, AR, AZ, CA, CO, CT, DE, DC, FL, GA, HI, ID, IL, IN, IA, KS, KY, LA, ME, MD, MI, MN, MO, MT, NE, NV, NH, NJ, NM, NY, NC, ND, OH, OR, PA, RI, SC, TN, TX, VT, VA, WA, WV, WI, WY. Additionally, you must be 21 years and older to purchase gift baskets containing wine. And UPS cannot leave this package without an adult signature; someone 21 or over must be there to sign for it. Store the items in the refrigerator.